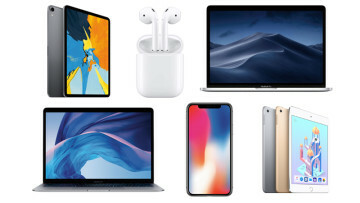 It's a New Year, and with it brings new deals courtesy of our partners at TechBargains. 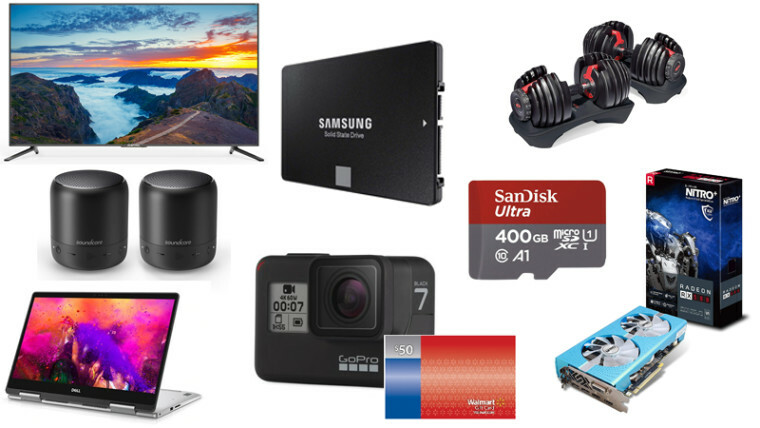 Among the discounts on offer today you'll find the lowest price on a Samsung 860 EVO 500GB SSD (only $68.40 with Coupon) and a 4K GoPro HERO7 Black + $50 Gift Card for just $399. Dell Inspiron 15 7000 Intel Core i5-8250U Quad-core 15.6" 1920x1080 IPS 2-in-1 Touch Laptop with 256GB SSD for $649.99 at Dell (use code: 50OFF699 - list price $889.99). 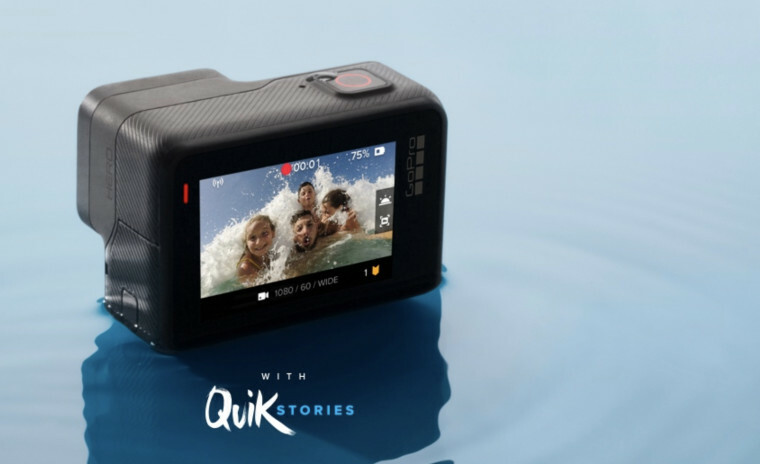 GoPro HERO7 Black 4K Waterproof Action Camera + $50 Walmart Gift Card for $399 at Walmart (Scroll down to "Buy Together & Save" - list price $449). Back in stock: OVERPOWERED Gaming Laptop 17+ Intel Core i7-8750H 6-Core 17.3" 1920x1080 144Hz Gaming Laptop with 6GB GTX 1060, 32GB RAM, 256GB SSD + 2TB HDD for $999 at Walmart (list price $1699). 65" Sceptre U650CV-U 4K UHD LED HDTV for $399.99 at Walmart (list price $899.99). Samsung 860 EVO 500GB SATA III 2.5" Internal Solid State Drive for $68.40 at Amazon (Clip 5% Coupon - list price $109.99). Sapphire Radeon Nitro+ RX 580 Special Edition 8GB GDDR5 Graphics Card for $219.99 at Amazon (list price $329.99). SanDisk Ultra 400GB microSDXC Card with Adapter for $89 at Amazon (list price $249.99). Anker Soundcore Mini 2 Bluetooth Speaker (2-Pack) for $45.99 at Amazon (list price $61.99). Bowflex SelectTech 552 Adjustable Dumbbells Set (Pair) for $224.10 at Amazon (Clip 10% Coupon - list price $299). SkyTech Gaming Shadow Mini AMD Ryzen 2600 Gaming Mini Desktop with Radeon RX580, 500GB SSD for $719.99 at Walmart (list price $999.99). 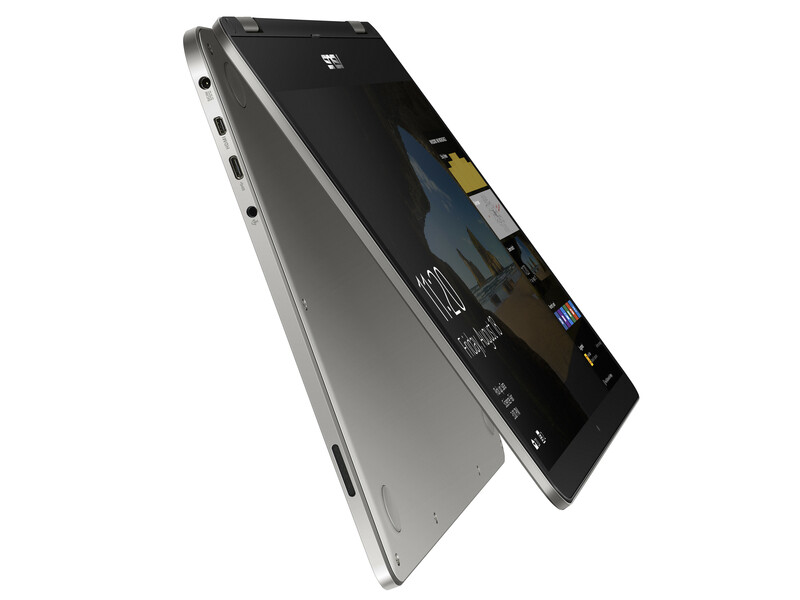 Dell XPS 15 (9575) Intel Core i7-8705G Quad-core 15.6" 1920x1080 InfinityEdge IPS 2-in-1 Touch Laptop with Radeon RX Vega M GL GPU for $1349.99 at Dell (use code: 50OFF699 - list price $1709.99). Dell Vostro 15 3000 Intel Core i5-7200U 15.6" 1920x1080 Win10 Pro Laptop for $429 at Dell (use code: VOSTROSAVE200 - list price $898.57). 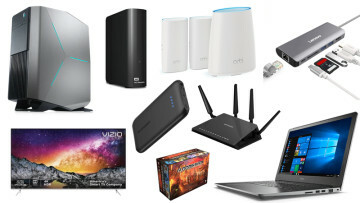 MSI GV62 Intel Core i5-8300H Quad-Core 15.6" 1920x1080 Gaming Laptop with 3GB GTX 1060, 256GB SSD, Fortnite Bundle for $899 at Walmart (list price $1099.99). 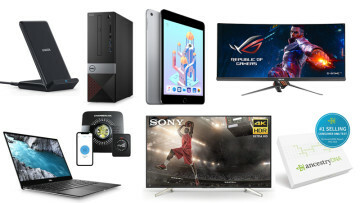 Dell Inspiron 14 5000 Intel Core i7-8565U Quad-core 14" 1920x1080 IPS 2-in-1 Touch Laptop with 256GB SSD for $699.99 at Dell (use code: 50OFF699 - list price $899.99). 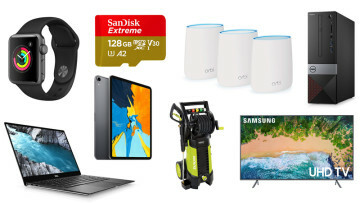 Dell Inspiron 15 5000 AMD Ryzen 5 2500U Quad-Core 15.6" 1920x1080 Laptop with Radeon Vega 8 for $418.95 at Walmart (list price $549). ASUS VivoBook Flip 14 Intel Core i3-8130U 14" 1920x1080 2-in-1 Touchscreen Laptop for $418.95 at Walmart (list price $499). 50" Vizio D50x-G9 4K UHD HDR Smart LED HDTV with Voice Remote and Chromecast for $298 at Walmart (list price $428). 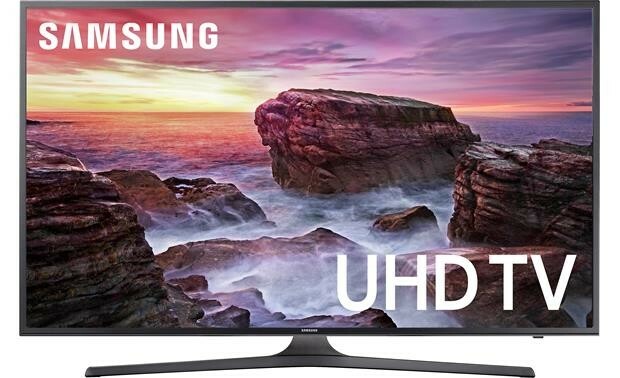 50" Samsung UN50NU6900 4K UHD Smart LED HDTV for $377.99 at Walmart (list price $599.99). 55" Vizio D55x-G1 4K UHD HDR Smart LED HDTV for $379.99 at Walmart (list price $478). 55" TCL 55S405 4K UHD HDR Roku Smart LED HDTV for $349.99 at Walmart (list price $599.99). The Planet Earth Collection (Blu-Ray) for $24.99 at Amazon (list price $64.99). Sony PlayStation Classic Mini Console for $59.99 at Walmart and Amazon (list price $99.99). Nintendo Switch Joy-Con (L/R) Controller (Neon Red/Neon Blue) for $66.77 at Amazon (list price $79.99). Nintendo Switch Joy-Con AA Battery Pack for $12.99 at Amazon (list price $34.99). PowerA Enhanced Wireless Switch Controller for $39.99 at Amazon (list price $49.99). Bayonetta 2 (Physical Game Card) + Bayonetta (Digital Download) (Nintendo Switch) for $49.19 at Amazon (list price $59.99). Kingston A400 240GB SATA 3 2.5" Solid State Drive for $29.44 at Amazon (Clip 5% Coupon - list price $39.99). Crucial MX500 500GB 3D NAND SATA 2.5" Internal Solid State Drive for $64.59 at Amazon (Clip 5% Coupon - list price $72.99). SanDisk High Endurance Video Monitoring 64GB microSDXC Card with Adapter for $17.79 at Amazon (list price $39.99). Google WiFi AC1200 Mesh Router System (3-Pack) for $249 at Walmart (list price $299). Google Home Hub 7" Smart Display for $99 at Walmart (list price $149). Sony Xperia XA2 32GB 5.2" Unlocked Smartphone for $200 at Amazon (list price $349.99). Sony Xperia XA2 Ultra 32GB 6" Unlocked Smartphone for $249.99 at Amazon (list price $379.99). Auto-Vox T2 4.3” LCD Rearview Mirror Monitor Backup Camera Kit for $97.99 at Amazon (use code: XVHY9BPG - list price $139.99). Brother MFC-L2685DW Compact Monochrome All-in-One Wireless Laser Printer for $124 at Walmart (list price $139.88). 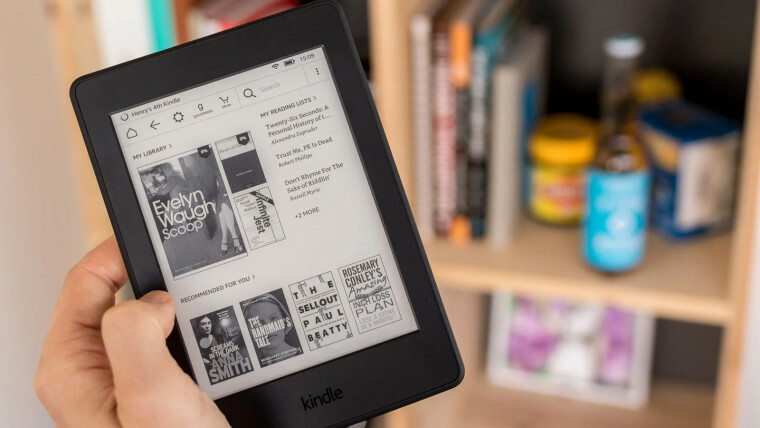 Amazon Kindle Unlimited 3-Month Subscription (New Subscribers Only) for $0.99 at Amazon (list price $29.97). TurboTax Deluxe + State 2018 Tax Software (PC/Mac Disc) for $39.99 at Amazon (list price $59.99). TurboTax Premier + State 2018 Tax Software (PC/Mac Disc) for $54.99 at Amazon (list price $89.99). TurboTax Home and Business + State 2018 Tax Software (PC/Mac Disc) for $64.99 at Amazon (list price $99.99). Flash Furniture Mid-Back Mesh Executive Swivel Chair for $52.04 at Amazon (list price $60). GE 6-Outlet Tap Wall Plug Adapter Power Strip for $5.04 at Amazon (Clip 5% Coupon - list price $9.99).